We just returned from a trip to Disneyland in California. I hadn't been since I was eight year old. I'm now 28, married with one kid and one of the way. We took advantage of the military discount while we were there and it was awesome!! What is the Military Discount? At Disneyland in California, it is a 3-day hopper pass for $132 per person ($41/day). The military member can get up to 6 tickets (including himself) at that rate. I got a ticket for me, my wife, her parents and two sisters. So we maxed out the deal and got all 6 tickets. You can go to any branches ticket office. I am Army and I went to the Air Force Academy's Ticket Office. If you are not near a military base you can actually order them over the phone but that is a complicated process and takes several wks. You can also buy them at Disneyland but you may have to pay additional taxes where as the tickets are tax free on base. 2.) Go to the office and pay for the tickets. At the Air Force Academy ticket office, the price was $130 per ticket with an overall $10 processing fee so they tickets ended up being $131.67. They will print you out a voucher for each ticket you buy. Kids under 3 get in for free! 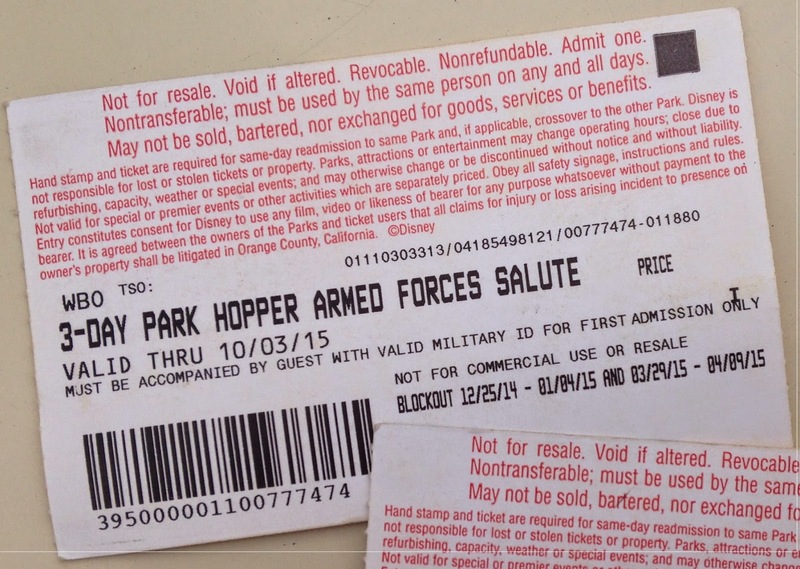 How much am I really saving by using the Disney Military Discount? A 3-day-ticket for a child (ages 3-10) is $224. The price for an adult is $235. If you want to add the hopper pass which is a must then it is an additional $40. So the total price for a normal 3-day-hopper-pass is $264-$275. So basically the military pass is 50% off!!!! 3.) Bring the vouchers to Disneyland and present them at one of the normal ticket lines. They will issue you your official 3-day-pass (see photo below). They take a picture of you and that picture comes up on a screen each time you try and enter the park. You can bring in any food or drinks that you want, which will save a lot of money if you're at the park all day. But no glass except for baby food in glass jars. Bring in your own big water bottle. You can get a pin "first visit" at customer relations just inside the gate. And this is not an all-inclusive list! If you have questions about if it's safe to ride, ask the cast members running the rides. And don't forget all the other things you can do besides rides - food, Aladdin, World of Color, Zoloft's Snow Palace, the Parade, Fireworks, etc. Pirates of the Carribean was not included on this list, however, I was surprised at the two significant drops and probably would not have done that again. A big stroller was a must for us, but was a challenge to fit in our small rental car. We needed a stroller that could fit our big cooler with all our food for the day, sunscreen, jackets, etc. Consider renting a nice stroller from City Stroller Rentals. They are nice, as cheap as $35 for 3 days, and they will deliver them free to your hotel or to Disneyland. A heard a rumor about Disney's Pink Pass, allowing pregnant women a disability pass so they didn't have to wait in line, and could come back through the fast pass line. I asked Customer Relations, and despite my Doctor's note, they no longer issue disability passes for pregnancy. At any location where they serve soda, they will give you a cup of ice water for free. The Baby Care Centers are especially nice (Walt Disney insisted on having them in the parks). They have high chairs, nursing rooms, pumping corners, formula/diaper rash ointment for purchase, a microwave, etc. When you're not close to one, there are big, sturdy changing tables in all the bathrooms. If you're coming from the parking lot, you'll be taking the tram to the parks. If you have a lot of junk in your stroller, there are some compartments in the tram (the section used for wheelchairs) that are bigger and they let you wheel the entire stroller on, instead of having to fold it up. If there is someone boarding with a wheelchair, you can even use the ramp. Downside - there is usually a longer wait time for these sections of the tram. If you're going to sit in normal seating, keep your stuff together before letting it explode in the stroller so you don't have a lot of packing while boarding. We found ourselves often walking to parking too, instead of using the tram. It was a 10-15 minute walk and it allowed our baby sleep after a long day. I used the list of rides that pregnant women can go on to guide us to the rides that a 1 year old can go on. I found they were the same. You can park in Downtown Disney for 3 hours and for 2 extra hours if you buy something at one of the food locations. There are some cheaper places where you can buy a just a drink and that counts. This is another option if you know you need to go back to the hotel to put your kids down for a nap in the middle of the day and you don't want to pay the $17 parking fee if your hotel is not within walking distance.